During this spring festival that is celebrated in March, the layman and the monks come together and celebrate the rich mythological past of Bhutan. 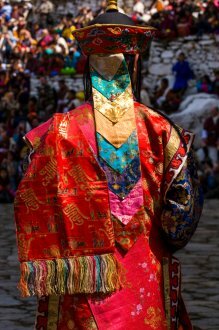 The festival is celebrated in the city of Paro where people put on colourful clothes, costumes and masks to signify gods and demons, good or bad, positive and negative, and enact stories from their culture. Another importance of Paro Tshechu is that the 350 year old four storey long religious scroll called ‘thangkha’ is displayed. Major activities to do: Visitors should try out the traditional cooking and meditation taught by the monks. The festival of Punakha Drubchen signifies the victory of Bhutan over Tibet during an invasion. During this festival, the locals re-enact the fight and the festival has become an annual event now. The 5 day festival is then followed by another three day event called Punakha Tshechu. The significance of Punakha Tshechu is that it keeps the noble work of Zhabdrung Rimpoche alive. Major activities to do: Make sure to visit Chief Abbott Je Khenpo’s winter home. Celebrated in Sakteng, the festival celebrates the blessings from the local deities and is an opportunity for merrymaking. The Brokpas (locals of Sakteng valley) have preserved their culture and traditions for centuries now and they celebrate it by playing folk music and dancing. It is one of the important festivals and fairs in Bhutan celebrated in June. Major activities to do: During the festival, a Yak dance and Ache Lhamo dance is organised which should not be missed. The Gomphu Kora Festival is celebrated by the people of Trashigang and signifies the victory of good over evil. The founder of Gomphu Kora was Guru Padmasambhava who spent three days meditating in a cave and defeated the evil that was residing there. The actual meaning of Ghomphu is meditation cave while Kora stands for circumambulation. 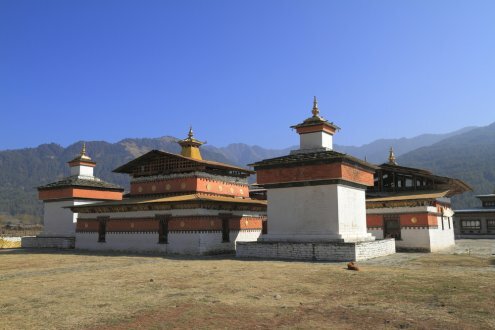 Jambay Lhakhang Drup is celebrated in November by the people of Bumthang to commemorate the construction of Jambay Lhakhang temple as well as the noble work of Guru Rinpoche. The locals get together and perform several dance rituals. Like other fairs and festivals in Bhutan, Jambay Lhakhang Drup also celebrates the blessings of the deities. Celebrated in the 8th month of the Lunar Calender, Thimphu Tshechu is an opportunity for the citizens to get together and celebrate the prosperity of the country. The rituals include wearing traditional clothes and dancing in the ways established by lamas. It is held in the capital city of Thimpu. The locals of Bumthang celebrate Matsutake festival to shed light on the local harvests of mushrooms in an attempt to promote organic harvesting. Visitors can try delicious food made by the locals. It is celebrated in the month of August. Major activities to do: A mushroom picking tour is held during the festival which should not be missed. Wangdue Phodrang Tshechu is another festival in Bhutan that celebrates the blessings bestowed upon the people by the deities. It was started by Zhabdrung Ngawang Namgyal and has been in practice since the 17th century. Wangdue Phodrang Tshechu is celebrated in October and people get together to perform dances. Major activities to do: The Dance of Ox is something that should not be missed during this festival. The festival is a celebration of the traditions and culture of the locals of Merak valley. It lasts for three days where the community organises an exhibition. There is dance, music and merrymaking during these three days and visitors can experience the yak dance performance as well. Visiting Bhutan during the Haa summer festival is a great way of experiencing traditional Bhutanese culture. Celebrating the traditional lifestyle of the locals, the festival is full of colour, energy, dance and music. The locals also organise sports activities, religious performances and present their local cuisine. It is hosted in Haa during the month of July. Major activities to do: During the festival visitors can take part in photography competitions and try mountain biking. 1. Why should one visit Bhutan during the festive season? Bhutan is a peaceful land where the locals cherish their traditions and their heritage like no other. They are proud of their peaceful ways and religious ideologies. During the festive season, Bhutan becomes even more colourful and energetic. The locals dress up in colourful clothing, have performances, re-enactments and dances that represent the rich culture of Bhutan. 2. How long does the Haa Summer festival last? The Haa Summer festival lasts for 2 days. This year, it will start on 13th of July and end on the 14th. 3. What is something tourists must do when visiting Bhutan? When visiting, even if not in the festive season, tourists should make sure to visit the Dzongs like the Trongsa Dzong, Lhuentse or Jakar Dzong among others. The Dzongs are the administrative, military, social and religious centers of a district. The accommodations for the monks are also inside the Dzongs. Get Hotels in Bhutan!